machine built by a collection of today’s finest storytellers, and enter a range of futures where familiar tales are reimagined in an astonishing variety of styles. Editor Andrew Carl and Producer Chris Stevens bring you the next wave of leading writers and illustrators, working alongside superstar creators like Farel Dalrymple (Pop Gun War), Ryan Ottley (Invincible), Khoi Pham (Daredevil), and Brandon Graham (King City) to deliver a reading experience that will delight generations young and old. 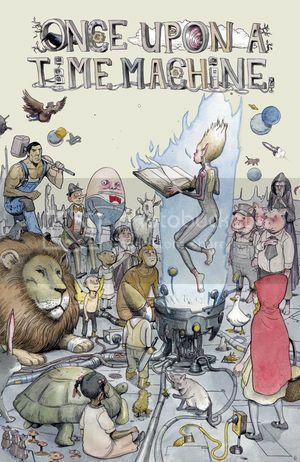 This graphic novel anthology was a play on fairy tales set in an alternate reality or the far future. John Henry is a space mechanic that is being replaced by machines. Pinocchio is a computer that wants to be real. The Three Billy Goats Gruff is a girl trying to get medicine in an abandon city with robots guarding the buildings. The Tortoise and the Hare is a dangerous race with traps and betrayal. These stories are creative and vary from author to author. The artwork is suburb in each story and I found myself wondering what other works some of the artist have done. There were also panels between stories with a look at Red Riding Hood and the Three Little Pigs that I would have loved to see in actual stories. I guess there is the expression- Always leave them wanting more! Teens will love the updated stories and I know there is an artwork style in this book that will for them. Amazing book where Aisling (Ash), is torn between the Fairie Prince and the Huntress. For more on Ash, click here. Given the gift, or curse, of always having to obey every order given, Ella must find the strength to take charge and find her own destiny, as well as break the spell. A Newbery Honor book. Thrown in the dungeon for daring to defy her royal engagement, Ella escapes to a refuge camp, and finds her true destiny. First in the four part Lunar Chronicles, cyborg Cinder’ s world is dying of a mysterious plague, and the Prince is being forced to marry the Lunar Queen. Will Cinder’s secrets help or hinder the Prince and the country? For more on Cinder, click here. Forced to be the family servant after her step-sister becomes ill, Xing Xing tries to escape the only way she knows how, with her skills in calligraphy and the help of the spirit of her mother. Bound combines both the Western and Eastern Cinderella stories. All of the princesses of the realm were given special gifts on their birthday, and Amethyst, the seventh born and considered lucky, is no exception. She is given Wit, Charm, Health, Courage…. and Ordinariness. Elena was supposed to be her kingdom’s Cinderella, but when the story changes, Elena finds that Tradition may have to change in order to make her story fit it’s new path. Not technically YA (published for adults) but I wouldn’t hesitate to give it to older readers. Also the first in a continuing series following the kingdoms and twisting of fairy tales, so if they like this one, there are more to hook them with! Lucy is stuck with her new step-mom, slaving away at chores, but manages to attract the attention of the most popular guy at school. Question is, does she want it? Shipped off for the first 13 years of her life, Bella has to return to her father and his jealous new wife, and deal with magic and intrigue in order to save the prince and the kingdom. After witnessing the murder of her father and cousins, Suzume must use her magic as a Shadow Weaver to protect herself from those who were responsible and find her revenge, before she looses herself in the process. Agree? Disagree? Share in the comments! “And maybe she’d been right to do it. Maybe it was Cinder’s duty as a cyborg to sacrifice herself so all the normal humans could be cured. Maybe it did make sense to use the ones who had already been tampered with. But Cinder knew she would never forgive Adri for it. The woman was supposed to be the one to protect her, to help her. If Adri and Pearl were her only family left, she would be better off alone. Cinder, the first of four books in Marissa Meyer’s Lunar Chronicles, spins the familiar Cinderella story into the far off future. Cyborg, not remembering her past, Cinder is the adopted daughter who is a mechanic to provide for her adoptive family, made poor after the death of her “father” and her guardian blows through the savings. A plague is devastating the world, infecting first the outerlands and now the city at an alarming rate, and cyborgs are being drafted in order to be experiment subjects for a cure- after all, you can’t experiment on pure humans, and cyborgs aren’t real humans. The Emperor has contracted the plague, and his heir, Prince Kai, must somehow deal with the Lunar Queen and her threats of war against earth- the only answer seems to come at too dear of a price to pay. Cinder holds all the of the traditional elements of Cinderella (outcast daughter, handsome prince, wedding ball, must find suitor, will she go to the ball, will they get together, etc. ), but puts some wonderful spins on it as well. Being set in a futuristic Eastern Commonwealth, Cinder’s world seems to hold to a largely throwback Asian mindset: pureblood first, then adoptive, and finally outcast, so Cinder would be the bottom of the bottom being not Asian (found in a different country), then adoptive, then cyborg. The marketplace and stalls where she works, and the quarantine where the plague victims are kept are also similar to historical times more than futuristic endeavours, with rickety stalls and fold up cots- only the technological intrusion of robot medics and police change the scenery. Also, Cinder turns gender roles on their ear. Prince Kai is the one who’s having to consider marriage to Queen Levana, who’s people has mind magic, but it’s clear in the one scene that if he will not marry her that there is another prince that might be able to take on the deal and save the Earthens. A refreshing change- instead of marrying off the daughters, we’re having to marry off the sons- and Prince Kai does not seem able to make command decisions anywhere within the book. Cinder the cyborg isn’t a scullery maid- she’s a mechanic fixing androids, scouring the junkyard for parts, and eventually fixing up an orange VW bug for her very own escape vehicle (yes, it’s her pumpkin). And Cinder the girl isn’t waiting to be rescued- she’s the one doing the rescuing. She’s trying to assist in finding a cure for her sister Peony, she’s trying to rescue her android, and near the end, she’s trying to rescue Prince Kai. I really enjoyed Cinder, the only drawback I can see to giving it to any reader would be that the cover could turn off guy readers. I understand why (hello, it is Cinderella, so we need the shoe, and you can see the cyborg workings underneath the skin), but it can skew more female than male. I would definitely recommend Cinder to readers who enjoyed Starters by Lissa Price, Shadow and Bone by Leigh Bardugo, or the Uglies Series by Scott Westerfield. Yesterday I went and saw Snow White and the Huntsman. It was the second retelling of Snow White I have seen this year as I also went and saw Mirror Mirror. And many of us spent Sunday nights waiting to see which fairy tale they would incorporate into Once Upon a Time, the hit television show. From Robin McKinely to Alex Flinn, fairy tale stories get told and retold time and time again. If you follow on Facebook or Twitter you know that we do a weekly featured called Friday Fill-Ins. This is usually a discussion feature where you are asked to fill in the blanks. So today for fun I thought we would do a fun little contest involving classic children’s stories. Below are 10 pictograms. See if you can identify the children’s classic it depicts. My favorite fairy tale retelling is ______________________ by _________________________. Fill in the blanks in the comments. These images were made on my iPhone using my camera and Diptic. Feel free to download them and share as a fun contest with your teens (or staff). Or use it as an example of a way you can create fun contests of your own. upon a time, there were tales . . . and today, those tales are being re-told. With a twist. One of my very favorite fairy tales retold is Enchanted by Orson Scott Card. It is a retelling of Sleeping Beauty; but what I really love about it is the way he portrays the magic of womanhood. What we call women’s intuition he calls magic and as he weaves his world you know that you are a part of something special. Some of my other favorites include Ella Enchanted by Gail Carson Levine (great book, horrible horrible movie) and Beastly by Alex Flinn (ditto). It is fun to read these twisted takes on old stories and see how they can be re-imagined. And how can you overlook the always fantastic The Princess Bride by William Goldman. And the movie, a perennial classic that still should work with the teen audience . . . Soon there will be 2 shows debuting on TV that focus on retelling classic fairy tales: Once Upon a Time and Grimm. The zeitgeist is right to start pushing those teen fiction tales, old and new, by making displays and doing programming tie ins. Why here’s a poster to help you with your display needs. You’re welcome. There is a pretty good list of fairy tales old and new at GoodReads. There are also some here, here and here. Publisher’s Weekly also had an article in the February 17, 2011 edition that talks about a new Harlequin series. For younger teens, bead and princess themed crafts would work. You can also do some Nerf jousting. Build castles out of Legos. Play capture the flag. Life size chess (think Harry Potter) or Battleship would also work. Do not underestimate the fun in some water fights during the summer months (outside of course). If you are so inclined, these stories are a great opportunity to engage in some fun reader’s theater activities. Or you could have the teens make and put on fairy tale inspired puppet shows for younger kids. John Sciezka tales would work great for that. You could have a series of events where teens selected the pieces, wrote the scripts, discusses approach and practiced, and then presented. This is a great idea for increasing teen involvement in your programming. Fairy tales are ripe for creative writing and drawing exercises. The exquisite corpse works for both storytelling as well as creature drawing. Also, any activities that focuses on monsters, costuming (think Project Runway type challenges), and survival (let’s face it – we all want to survive the evil beings that haunt fairy tale land). You can set up a fairy tale themed scavenger hunt through your library where they have to help Little Red Riding Hood get the basket of goodies to grandma. They collect the basket of goodies as part of the scavenger hunt. Be sure and get a teen to play the part of the big bad wolf and create fun obstacles along the way. Don’t think for a moment that teens don’t let to be pampered like a princess, so princess make-overs would definitely work. You could decorate flip flops to be pseudo glass slippers and make bead tiaras. And there are some great spa activities in Beauty: Things to Make and Do by Jennifer Traig. Fairy tales are full of imagination, which makes them fun to adapt for programming. You can find tie-ins for a variety of crafts and activities. And the more creative opportunities you allow teens to engage in, the better. If you don’t want to do come to the library programming, you can do drawing and story telling programming in the form of contests where teens create and share online. Whatever you do, be sure to tap into this pop culture moment and strike while the iron is hot. And please feel free to share your programming ideas and pictures in the comments or on the TLT FB wall.